Recording sessions can be time-consuming. The process of recording a song or album is often very interesting. Its like playing live in the studio, with the difference that if one goofed, they had to do it all over. Small corrections could be made but especially erasing something from the tape was a problem. Later on with the introduction of multi-track recording equipment it became much easier to alter the recordings. Channels could be erased or added and levels could be adjusted for each separate channel. Often a track that ends up on an LP or 45 contains overdubs that were made at a later stage and added to the master take. Also most of The Elvis masters contain such overdubs. This set contains the master takes as they were made in the studio, without those overdubs. 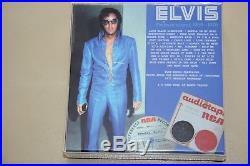 Its as close as it gets tothe pure sound of Elvis. 01 Long Black Limousine 02 This Is The Story Vr 03 Wearin' That Loved On Look Vr 04 You'll Think Of Me Vr 05 I'm Movin' On 06 A Little Bit Of Green 07 Gentle On My Mind Tr/vr 08 In The Ghetto Vr 09 Rubberneckin' 10 Hey Jude 11 My Little Friend V. 10 Twenty Days & Twenty Nights 11 I've Lost You 12 The Sound Of Your Cry / Edited 13 The Fool 14 Little Cabin Home On The Hill 15 Cindy, Cindy 16 Bridge Over Troubled Water 17 Got My Mojo Working / Keep Your Hands Off Of It 18 How The Web Was Woven 19 It's Your Baby, You Rock It 20 Stranger In The Crowd CD 3 01 I'll Never Know 02 Mary In The Morning 03 It Ain't No Big Thing (But It's Growing) 04 You Don't Have To Say You Love Me 05 Just Pretend 06 This Is Our Dance 07 Life 08 Heart Of Rome / Composite 09 When I'm Over You 10 I Really Don't Want To Know 11 Faded Love 12 Tomorrow Never Comes / Composite 13 The Next Step Is Love 14 Make The World Go Away / Composite 15 Funny How Time Slips Away 16 I Washed My Hands In Muddy Water 17 Love Letters 18 There Goes My Everything 19 If I Were You CD 4 01 Only Believe 02 Sylvia 03 Patch It Up 04 Where Did They Go, Lord 05 Whole Lotta Shakin' Goin' On 06 Rags To Riches Vr 07 The First Time Ever I Saw Your Face 08 Early Mornin' Rain / Composite 09 Miracle Of The Rosary 10 Help Me Make It Through The Night / Composite 11 Until It's Time For You To Go 12 I'll Take You Home Again Kathleen 13 It's Only Love 14 He Is My Everything 15 I, John 16 Separate Ways 17 Where Do I Go From Here 18 Burning Love / Edited 19 Fool 20 Always On My Mind 21 It's A Matter Of Time 22 Take Good Care Of Her 23 I've Got A Thing About You Baby CD 5 01 Girl Of Mine 02 Sweet Angeline 03 I Got A Feelin' In My Body 04 It's Midnight 05 You Asked Me To 06 If You Talk In Your Sleep 07 Mr.
/ Vocal Repaired Undubbed Master 07 Any Day Now / Vocal Repaired Undubbed Master 08 For The Good Times / Undubbed Master With Vocal Overdub 09 Love Song Of The Year / Undubbed Master With Backing Vocals 10 Pieces Of My Life / Undubbed Master Different Mix 11 Heart Of Rome / Take 3 & Workpart 1 Used For Composite Master 12 Inherit The Wind / Vocal Overdub Take 1 Used For Composite Master 13 Inherit The Wind / Vocal Overdub Take 2 Used For Composite Master 14 Rags To Riches / Take 3 Used For Composite Master 15 Rags To Riches / Take 4 Used For Composite Master 16 Bitter They Are Harder They Fall / Undubbed Master. Tr Track Replaced Vo Vocal Overdubbed Vr Vocal Replaced. Undubbed Master Unedited Undubbed Master Unrepaired Undubbed Master Unedited Unrepaired Undubbed Master. 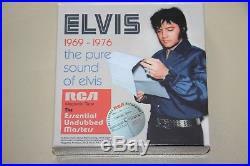 The item "The Pure Sound of ELVIS PRESLEY Essential Undubbed Masters 1969-1976 8 CD Box" is in sale since Sunday, April 08, 2018. This item is in the category "Musik\Vinyl\Rock & Underground\Rock 'n' Roll". The seller is "aaronking2008" and is located in Runding. This item can be shipped worldwide.